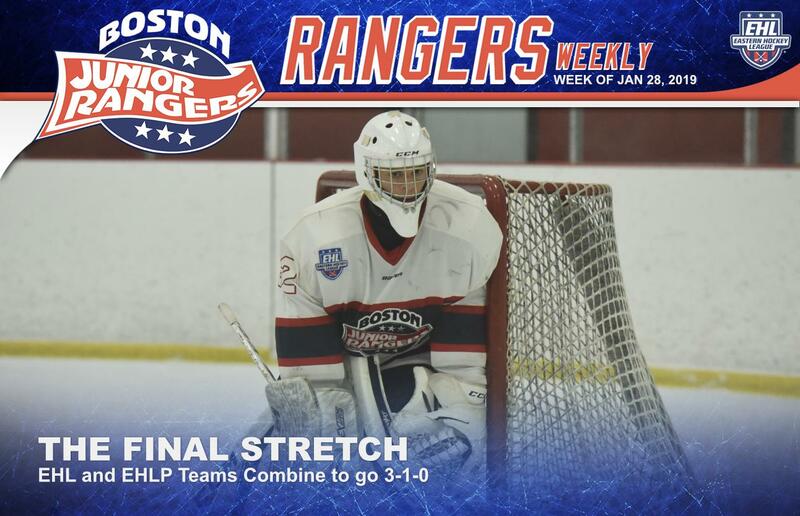 TEWKSBURY, MA -- Both Rangers squads were back in action this past week as the EHL team dropped their first game of the week, but bounced backed with a pair of wins over the weekend. After the three-game stretch, the Rangers still sit in 2nd place in their division with a record of 20-11-3. On the other end, the EHLP squad took care of business winning their only game of the week this past Saturday night. The Rangers continue to sit in 1st place in their conference with the best record in the entire league at 25-3-3. On Wednesday, the EHL squad traveled to Haverhill to face-off against the Valley Jr. Warriors. The Rangers won the previous two matchups against their divisional opponent, but came into Wednesday’s game on a two-game losing skid. After a scoreless 1st period, the Warriors struck first with a power-play goal around the 12-minute mark of the 2nd frame. The Rangers leading goal scorer, Andrew Keith, got the boys on the board just a few minutes into the 3rd period. However, the Warriors responded with two quick goals to take a 3-1 lead. Despite a late tally from Zack Norby, the Rangers fell by a final score of 3-2. Billy Girard was busy in net, stopping 31 shots in the loss. On Saturday, the Rangers looked to bounce back on the road against the New York Applecore. The Rangers won the first matchup between the two teams just a few weeks ago, and Saturday’s game followed a similar path. Norby got the boys on the board early, with a goal just under five minutes into the contest. After a scoreless 2nd period, Jake Maynard found the back of the net just minutes into the 3rd to give the Rangers a two goal advantage. Go Uemura added some insurance in the closing minutes to help seal the 3-0 win. Girard stopped all 14 shots that he faced for his 2nd shutout of the season. On Sunday, the squad capped off their weekend trip with a matchup against the Connecticut Chiefs. The Rangers took care of business against the Chiefs back in October in the two teams first matchup against each other. Just like the first matchup, the Rangers came out strong as Connor Galloway found the back of the net just 1:45 into the game to give the Rangers the early lead. Uemura followed suit with a power-play goal just a few minutes later to extend the lead. Just a few minutes after that, Galloway got his second goal of the period and the Rangers took a 3-0 lead just over eight minutes into the game. However, the Chiefs would respond with a pair of goals near the end of the frame to cut the deficit back to one. Keith gave the Rangers some breathing room with a goal just 40 seconds into the 2nd period, to give the Rangers back a two-goal lead. Both Norby and Jake Mecrones added 3rd period goals to put the game out of reach, as the Rangers won by a final of 6-2. Girard was solid between the pipes yet again, stopping 22 shots for his 9th win of the season. On Saturday night, the EHLP squad returned back on home ice for a matchup against the Walpole Express. Prior to Saturday’s game, the Rangers had already beaten the Express three times to date, by a combined score of 18-3, and this past weekend’s matchup wasn't much different. Nick Weaver got the Rangers on the board first with a goal around the eight-minute mark of the first period. With just ten seconds left in the frame, Matt McPherson converted on the power-play to give the boys a two-goal advantage. The Express cut the lead in half, halfway through the second frame, but McPherson scored another power-play goal to grab back the two-goal advantage. McPherson added two more goals in the 3rd period giving him four total goals on the night, with three of them coming on the man advantage. Matt Orlando added an insurance tally late in the period, and the Rangers cruised to a 6-1 win. Bobby McCloskey stopped 30 shots in route to his 13th win of the season. One busy week leads into another for the Rangers organization as the EHL squad has four games scheduled for this upcoming week, starting with a pair of homes games on Tuesday and Wednesday. The boys will then hit the road this upcoming weekend for a matchup against the Valley Jr. Warriors on Friday, followed by a game against the Seahawks Hockey Club on Saturday. The EHLP squad on the other hand, will travel to Walpole on Friday for a rematch with the Express and then will come home to play the Connecticut Chiefs on Saturday night. The Premier squad will then finish off their week with a divisional matchup in Haverhill against the Warriors on Sunday.